We tackle local distributed testing of graph properties. This framework is well suited to contexts in which data dispersed among the nodes of a network can be collected by some central authority (like in, e.g., sensor networks). In local distributed testing, each node can provide the central authority with just a few information about what it perceives from its neighboring environment, and, based on the collected information, the central authority is aiming at deciding whether or not the network satisfies some property. We analyze in depth the prominent example of checking cycle-freeness, and establish tight bounds on the amount of information to be transferred by each node to the central authority for deciding cycle-freeness. In particular, we show that distributedly testing cycle-freeness requires at least \(\lceil \log d \rceil -1\) bits of information per node in graphs with maximum degree \(d\), even for connected graphs. 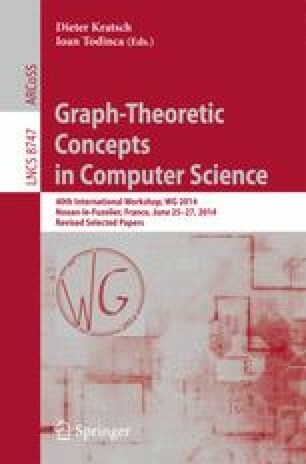 Our proof is based on a novel version of the seminal result by Naor and Stockmeyer (1995) enabling to reduce the study of certain kinds of algorithms to order-invariant algorithms, and on an appropriate use of the known fact that every free group can be linearly ordered. Pierre Fraigniaud: The first and second authors receive support from the ANR project DISPLEXITY, and from the INRIA project GANG. David Ilcinkas: Partially supported by the ANR project DISPLEXITY. This study was carried out in the frame of the program “investment for the future” of Idex Bordeaux-CPU.